cost of pursuing the matter usually exceeds your loss. protect, you'll just get ulcers worrying about image theft. they...ummm....wouldn't want to put up. If anybody copied a picture I posted I would feel flattered. The really neat situation is where someone links to your image. own personal (non-commercial) web sites. This used to annoy me, but I've pretty much gotten over it. species of fish). That one irritates me. A lot. I took a couple of photos of the very colorful area of impact. Ya reckon a big bloody toe picture would help sell fish? First thing to try is sending them an email asking them to cut it out. 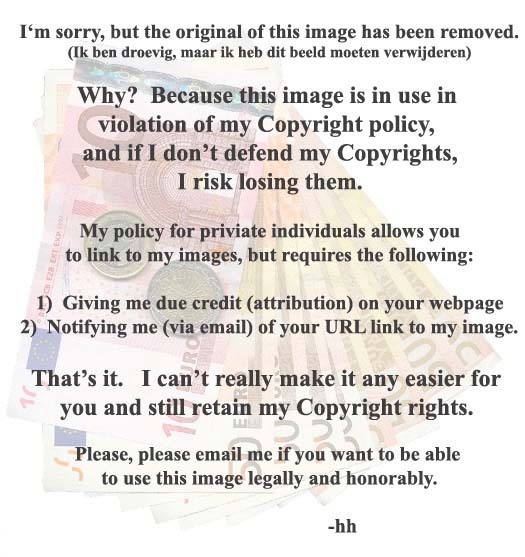 copyrighted image, as well as for the bandwidth. That would be bogus and probably accomplish nothing. change the source image to something less, um, saleable. Heh heh, I like that. if it has any flaws. Google, and the old version has been purged out of their archives. Grabbing a copy of their source code is a good idea too. image, as well as for the bandwidth. link) and you're just following-up (which you are). "Image removed because account is more than 30 days overdue"
an overdue acount fee, of course. enough trama then find one of Margaret Thatcher. That will definately do it. even know who was in charge of the web site. That I had my toenail ripped out, or using the image?